Hello again! 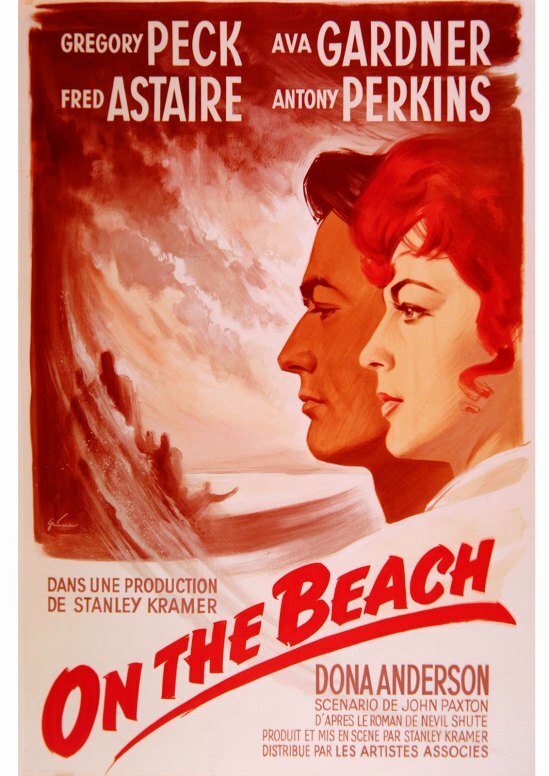 Our Atomic Film Fest continues this evening with 1959’s movie On The Beach. There was also a remake in 2000 (which I’ll discuss soon), but I think this must be one of the earliest movies made that contains a nuclear scare, although the “scare” is fairly mild. Quick Aside: When I was looking for pictures for “The Day After” in my last review, I kept getting pictures of “The Day After Tomorrow.” For this review, I kept getting pictures of these idiots, on something called “Ex On The Beach.” Is that the Jersey Shore that everyone was angry about a few years ago? Oh well, maybe having pictures of “attractive” (but is that what passes as attractive these days??) dummies in swimsuits may drive up Cinematic Attic’s page views. The idea is that The US and The USSR have bombed each other to hell, and there’s not much left of the northern hemisphere except a cloud of radiation that’s slowly making its way south. 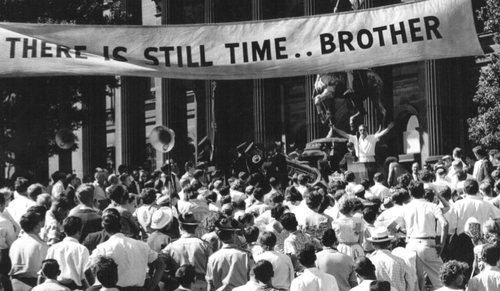 The bulk of the story takes place in Melbourne, Australia, where a US submarine crew has surfaced. There’s a bit of romance, as well as the question if there’s absolutely no hope up north, or if there might be survivors in Alaska or some other place. 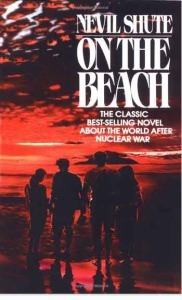 The movie was based on the novel by Nevil Shute, which I read in elementary or junior high school. I may be taking part in some revisionist personal history, but I think it was actually my mom who recommended this book to me. If so, that’s a bit dark, but it did work out well as blog fodder twenty years later. From what I remember of the book, it’s quite similar to both of the adaptations, although all three take place at different times. And all three are mostly bleak, no matter how much romance they try to add in. This one has some pretty decent acting, at least by old movie standards. I must admit that I’m generally not a fan of older movies, since they’re usually unbearably cheesy, but this one is pretty good. The ever-gravitas-filled Atticus Finch plays the submarine captain whose family has been killed out in the US, and the guy from Psycho plays an Australian military guy who doesn’t have an Australian accent. He’s married and has a baby daughter, so they’re especially concerned about the family’s impending doom. Fred Astaire, who I don’t think I’ve seen in any other movies but whose name I recognize, plays a kinda drunk-ish guy who drives a sports car. And finally there’s Ava Gardner; it’s probably best to just say she’s a bit crappy in this movie. That’s perhaps another issue I have with old movies: both the men and women seem to have motivations that are completely foreign to me, for whatever reason. I just get uncomfortable when watching them, like they way I felt when I saw Pierce Brosnan sing in Mama Mia! It’s not necessarily bad, but it’s certainly not good. The Guy From Psycho and this woman were both pretty good actors, especially taking into account it was 1950s acting. In the movie, they must come to terms with the idea that they may need to take a suicide pill, as well as give one to their daughter, to avoid the longer, slower radiation poisoning death. That’s legitimately heavy. Also, if you click on this picture, it’ll take you to a better review than this one. All that aside, it’s actually a pretty good movie. This one especially drives the point home that the war was avoidable and, for the people who watched it when it came out, that they were playing with fire if they thought a full-on nuclear war would be winnable. I would maybe even watch it again. Has anyone else out there seen it? Nostalgia Factor: 13/17 I was actually reminded a lot of the book when I saw this movie. But if I still remember plot points of a book I read 20 years ago, either it had a big effect on me, or I’m forgetting something else because of it, like how to perform canine CPR. Actually, that’s probably it. I took a canine CPR course in Germany in 2002, but I can’t remember how to do it. Dammit. 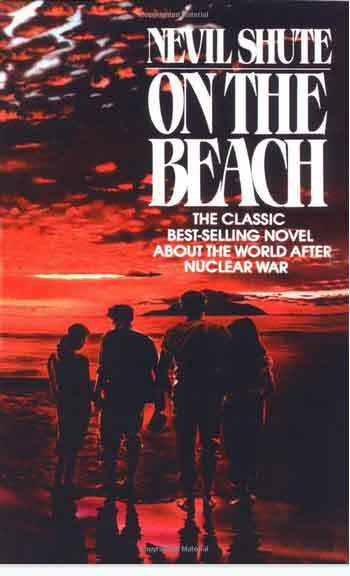 Scariness of the Nuclear Scare: 16/17 Unlike the 2000 remake, this doesn’t show any nuclear bombs at all, so technically the “scare” is in the invisible radiation that will kill all the survivors in the world. Which, now that I think about it, deserves a 17/17. One more for the road: Women wearing what I assume are supposed to be bikinis, although I can only recognize one as a garment bearing that name. 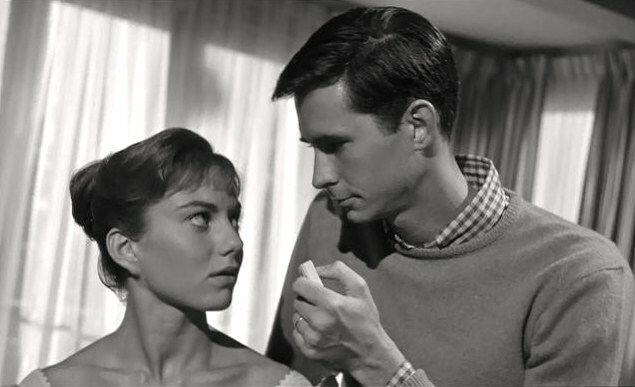 This entry was posted in Review, Ryan, Sitzman and tagged 1959, Anthony Perkins, Atomic, Atomic Film Fest, Beach, Bikini, Fest, Film, Gregory Peck, Movie, Nuclear, On The Beach, Review, Ryan, Scare, Sitzman, War by Ryan. Bookmark the permalink.